Are you searching the internet for “Electrician Delmar NY” or “Electrician In My Area“? If so, you must be having some type of electrical problem and are in need of a licensed electrician. Lammon Electric LLC can help! 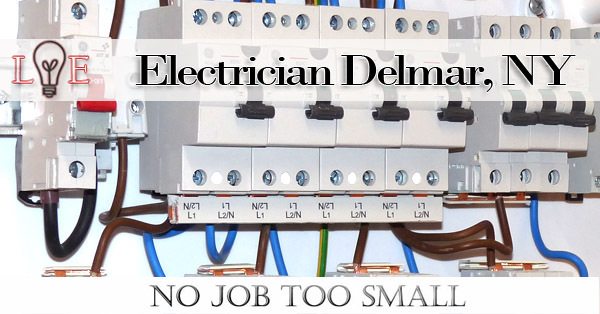 We are licensed electricians in Delmar, NY with the skills and experience to perform a variety of electrical repairs. You will find the electrical services we provide below. Serving the Capital District for more than 30 years, Lammon Electric, LLC., has the experience and we offer exceptional electrical services by licensed professionals. Whether you have a project in mind that is big or small, we can assist you with them all. We also offer electrical services for those new constructions you may have. If you would like to schedule a time for a licensed professional electrician, simply email us @ Glammon@nycap.rr.com or just give us a call @ 518 – 274 – 5100. We handle both, commercial and/or residential properties. “The professional electrician that was sent to us was Greg, and this young man was very polite at all times, and acted in a professional matter at all times, whether it was a scheduled visit or during the initial investigation for quoting the work that needed to be performed. The cost estimation was very fair for the quality of service I was expecting to receive, and especially for the amount of work that was to be involved. When it came time for the scheduled work to begin, Greg’s team arrived on time, and they began to perform the outlet and lighting work that had been discussed at an earlier time, everything was done in a professional manner, and to my surprise, they even kept things organized and picked up after themselves. Can you give some good reasons for why I should hire Lammon electric for my commercial and/or residential electrical work? Lammon Electric is fully insured, a licensed electrical contractor, and we give each and every one of our jobs special attention, Competitive bidding against other contractors, and we will guarantee that the work we are doing for you will be completed in a timely matter and the lowest budget available. Since we do not have large overhead costs we are able to offer our services at a more affordable budget for you, as we have manageable prices, unlike most all of the other companies. Do you offer your services in areas other than Delmar, New York? We certainly do! Currently, we also services Albany, the Capital District, Delmar, N.Y., and all surrounding areas. When hiring an electrician for residential properties in Troy, N.Y., is there anything I should be looking out for? Be sure that you are hiring an electrical contractor with experience in the area you need them for. Be sure the electrical contractor you hire is fully insured and that they are licensed and have the knowledge of which permits you will need in order for the work to begin. Keep in mind that it does not necessarily mean that you are going to be saving money because a company offers you a lower estimate. This goes to say that you need to be certain you are hiring an electrical contractor that is reliable, and is going to complete the work correctly the first time around, no matter the price. Need electrical repairs? Schedule your electrical services at: Glammon@nycap.rr.com or you can call us at: 518 – 274 – 5100.